Want to attract the attention from far distances, use our light pole banners! Having a display using custom pole banners is a great to attract attention and drive traffic toward a business' storefront because they can be seen from far away. 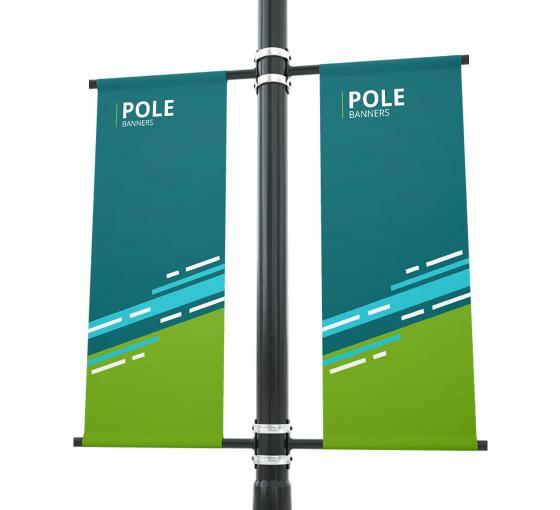 Have you ever driven down a main street and felt so welcomed because you came across vibrantly decorated street pole banners? These custom banners can be used during all times of the year to greet locals and visitors, promote events and even share holiday cheer. Because they are hung up high above many buildings, these light post banners can grab the attention of anyone who drives or walks by them. Vinyl banners can be used in many places, but they have to come in different shapes and sizes and can take up a lot of space. This is why BannerBuzz has a collection of custom pole banners and light post signs for you to consider instead. This way, your business, college or town can display a polished and professionally made banner without paying an arm and a leg and without cluttering up a lot of area. With multiple factories within the United States, we are able to offer many different light post signs, so you're sure to find a style that is perfect for your needs. BannerBuzz has many templates for users to consider, but anyone who wants to customize their banner from beginning to end can navigate through our web application. Our design team is available at any time to provide guidance for your order. Art proofs can be provided at no extra charge.